The deformation of armchair single-walled carbon nanotube under transverse electric field has been investigated using density functional theory. The results show that the circular cross-sections of the nanotubes are deformed to elliptic ones, in which the tube diameter along the field direction is increased, whereas the diameter perpendicular to the field direction is reduced. The electronic structures of the deformed nanotubes were also studied. The ratio of the major diameter to the minor diameter of the elliptic cross-section was used to estimate the degree of the deformation. It is found that this ratio depends on the field strength and the tube diameter. However, the field direction has little role in the deformation. Single-walled carbon nanotubes (SWCNTs) have attracted much research interests because of their special mechanical, electrical and optical properties [1–6]. Several types of nano-devices and nano-systems based on carbon nanotubes have been developed. In some cases, an electric field is applied to these devices to induce certain mechanical or electrical property changes [7, 8]. It has been reported that electric field can change effectively the structure and electronic property of a nanotube [9–19]. For example, an increasing transverse electric field can narrow the band gap of pristine , radial deformed  or defective  semiconducting SWCNT to zero. A theoretical study by Guo and his colleague predicted that axial electric field can lead to the elongation of SWCNT . The interesting responses of nanotubes to the electric field will definitely affect the application of nanotubes. From application point of view, SWCNTs are required to be mechanically reliable in most nano-systems. However, structural deformation of SWCNTs can be induced by electric field , especially when the electric field is high in strength (for example, several hundred mV/Å). Such high field strength may be required under extreme work circumstances and probably achieved by special methods , or it can be generated accidentally. Since the structural deformation is much related with the mechanical reliability, it should be taken into consideration for the SWCNTs working under electric field. In this case, an investigation of the relationship between the applied electric field and the resulted mechanical deformation is required. Here, we present the theoretical investigation on the deformation of armchair SWCNTs under uniform transverse electric field. The geometrical structures and electronic properties of the SWCNTs are calculated using density functional theory (DFT) [21, 22]. The structural changes of nanotubes with different lengths and diameters under the transverse electric field are discussed systematically. Several armchair carbon nanotubes with finite lengths (from (5,5) to (8,8)) were considered in the present work. The dangling bonds on the two ends of each nanotube were saturated with hydrogen atoms. The effect of electric field direction on the structural deformation was studied by applying electric fields with different directions. For a (n,n) armchair nanotube, electric field was applied along two chosen radial directions (denoted as direction EA and EB in Fig. 1, respectively). Direction EA is perpendicular to one of the horizontal C–C bonds (bonds that are perpendicular to the tube axis), whereas direction EB keeps an angle of π/(2n) to direction EA. The strengths of applied electric field were ranged from 0 to 2.8 V/Å. As the electric field may break the symmetry of the nanotubes, no symmetry constraint was imposed to the nanotubes during the simulations. The nanotubes were optimized using the DFT as implemented in the DMol3 Package [21, 22]. The generalized gradient approximation (GGA) in the PW91 version was adopted to compute exchange–correlation energy. The electronic wave functions were expanded in a double-numeric polarized (DNP) basis set truncated at a real-space cutoff of 3.7 Å. Comparing with the double numerical plus d-functions (DND) basis set, which is more popular for predicting the electronic properties of carbon nanotubes [23, 24], the DNP basis set takes into account the polarization p-function of hydrogen atoms to achieve better accuracy. The electronic structure was obtained by solving Kohn–Sham (KS) equations self-consistently with the spin unrestricted scheme. The self-consistent field procedures were achieved with a convergence criterion of 10−6 a.u. on the energy and electron density. Geometry optimizations were carried out until the force on each atom and the maximum displacements of the atoms were less than the threshold values of 0.002 a.u. and 0.005 Å.
where x c and y c are X and Y coordinates of the ellipse center, respectively. θ is the rotation angle of the ellipse about the Z axis. D maj and D min are the major diameter and the minor diameter of the ellipse, respectively. Their ratio D maj/D min was used to estimate the degree of deformation. Prominent structural deformations of the armchair nanotubes were observed when the electric field strength was in the range of several hundred mV/Å. It is found that the deformation is mainly in the radial direction. Figure 2a shows the deformed (7,7) nanotube under the 1.0 V/Å electric field. From that, the cross-section of the nanotube is changed from the regular circular shape to the ellipse shape. The tube wall is free of buckling or kink. Viewing along the axis of the nanotube, the diameter parallel to the field direction is increased, whereas the diameter perpendicular to the field direction is decreased. Contrasting to the initial diameter of 0.949 nm when no electric field is applied, the major diameter (D maj) and the minor diameter (D min) of the nanotube become 1.115 and 0.910 nm, respectively. However, the nanotube length remains to be 1.205 nm, the same as original. The deformation of the middle two atom layers of the nanotube (in the square of Fig. 2) was further investigated. The atoms in the layers were least affected by the hydrogen saturation on tube ends. Figure 3 shows the change of the dihedral angles in the deformed nanotube segment. It can be seen that about half of the dihedral angles are greatly changed under the transverse electric field. The largest magnitude of the changes is 6.8°, which is about 4.5% of the original angle (supplementary material Table S1). 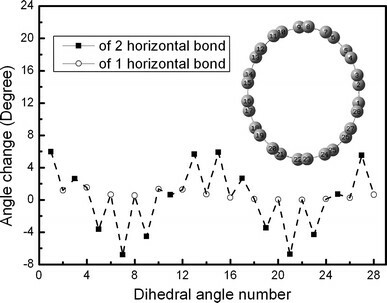 In contrast, the bond lengths and the bond angles were less sensitive than the dihedral angles to the transverse electric field (supplementary material Table S2 and S3). The largest changes of bond lengths and bond angles were only 0.76 and 0.33%, respectively. The results indicate that the deformation of the nanotube is mainly due to the change of dihedral angle. 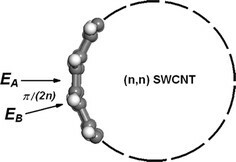 It is different from the reported case of SWCNT under axial electric field, in which the C–C bond elongation is the only significant contribution to the deformation of the nanotube . Moreover, it is found that different types of dihedral angles changed in different ways. The dihedral angles with only one horizontal bond increased in relatively small magnitude under the transverse electric field. These angles were almost zero when no electric field was applied, in agreement with the results from symmetry analysis. In contrast, the dihedral angles with two horizontal bonds changed in two different ways. From the initial value ~150°, the angles on the wall parallel to the electric field direction were enlarged, while those on the wall perpendicular to the field direction were shrank. More importantly, the average change (absolute value) of the dihedral angles with two horizontal bonds was by one order larger than that of the dihedral angles with only one horizontal bond. This indicates the dihedral angle with two horizontal bonds plays a major role in the transverse electric field–induced deformation of armchair nanotubes. The structural deformation of the nanotube was accompanied with the change of the electronic structure. Under zero electric field, except the atoms on the two end layers saturated by hydrogen atoms, all atoms were found to have small charges of magnitudes less than 0.0019e. This suggests that the atoms have uniform sp2 hybridizations. It is in agreement with the results from Chen et al. . When the transverse electric field was applied, the sp2 hybridization was perturbed and charges of carbon atoms were altered. 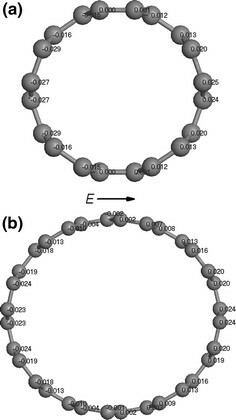 Figure 2b–2e show the distribution of Mulliken charges of atoms as well as the highest occupied molecular orbital (HOMO) and the lowest unoccupied molecular orbital (LUMO) of the (7,7) nanotube. It can be seen that the carbon atoms on the upper side possess positive charges, whereas those on the lower side possess negative charges. Charge accumulation on the two sides was observed as the electric field strength was increased. 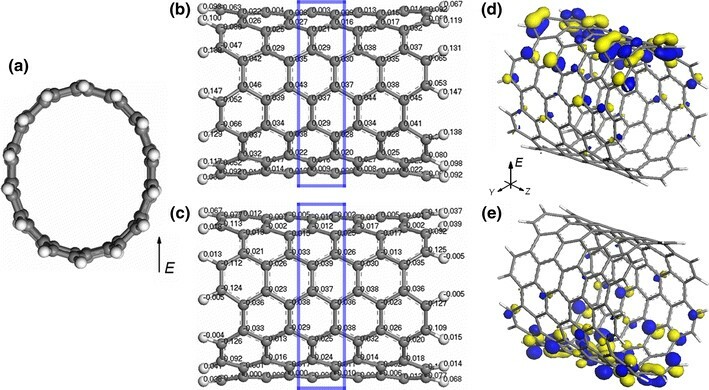 For the center carbon ring of the nanotube (in blue rectangle in Fig. 2), the maximum positive charges were 0, 0.014e, 0.024e and 0.037e for the field strengths 0, 0.4, 0.7 and 1.0 V/Å, respectively. The maximum negative charges were −0.002e, −0.014e, −0.023e and −0.039e for the field strengths 0, 0.4, 0.7 and 1.0 V/Å, respectively (supplementary material Fig. S1). The molecular orbital of the nanotube was also changed. The previous study has shown that for armchair nanotubes, the constituent parts of HOMO and LUMO belong to the separated part of atomic orbital in axial direction under axial external electric field [18, 19]. Here, the similar phenomenon was observed. However, the constituent parts of LUMO and HOMO belonged to the separated part of atomic orbital in radial direction under the transverse electric field. As shown in Fig. 2d, 2e, under the upward 1.0 V/Å electric field, the constituent parts of LUMO and HOMO of the (7,7) SWCNT are atomic orbital at the upper and lower side of the nanotube. It worths to mention that with increasing field strength, the energy gap between HOMO and LUMO was decreased almost linearly from 1.14 to 0.08 eV. The energy gap was 0.92, 0.47 and 0.19 eV when the electric field was 0.4, 0.7 and 0.9 V/Å, respectively. Similar linear decreasing of energy gap was obtained for other armchair nanotubes under increasing electric field. This is different from the result of applying axial electric field, which could result in non-monotonic changes of the energy gap . The D maj/D min ratio of each nanotube was “1” after structure optimization under zero electric field. However, they gradually increased with the increasing field strength. Figure 4 shows the calculated D maj/D min vs. field strength. All D maj/D min ratio curves in the figure bend upwards as the field strength increases, indicating the deformation can be intensified under higher electric field strength. By comparing the D maj/D min ratios of (5,5) nanotubes with different lengths in Fig. 4, we found the ratio was not sensitive to the tube length. As shown in Fig. 4, the D maj/D min ratios are not changed with the same electric field. The maximum difference of the ratios is 0.048, occurring at the electric field 2.5 V/Å. In addition, Fig. 4 indicates that the change of the field direction does not cause the extra difference in D maj/D min ratios. 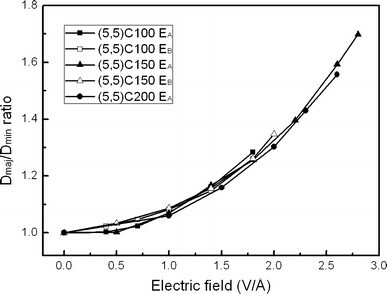 The maximum difference of the ratios caused by field direction difference is 0.031, occurring at the (5,5)C150 nanotube under 0.5 V/Å electric field. Based on the above results, we conclude that the D maj/D min ratio is independent of the tube length and the direction of the transverse electric field, and this ratio can serve as a general index for the radial deformation of nanotubes under transverse electric filed. To determine the direction of radial elongation of the nanotubes under electric field, we calculated the deflection angles of the nanotubes. The deflection angle is defined as the angle between the major diameter of the ellipse and the field direction. As shown in Table 1, most deflection angles are less than 10.0°, giving support to the conclusion that the nanotubes are expanded along the field direction. Some angles are larger than the average value when the electric field is extremely weak or extremely large. It is because in the weak electric field, the radial deformation is too small to well-define deflection angle. Whereas in the strong electric field, the nanotubes sustain large strains. There are out of ellipse-plane displacements of the atoms (prominent at the boundary), which leads to the deflection of the direction of the major diameter. Figure 5 shows the deformation of 4 nanotubes with same length (about 1.2 nm) and their initial diameters range from 0.68 to 1.09 nm. The D maj/D min ratios of the nanotubes with larger diameters are larger than those with small diameters under the same electric field strength. For example, the D maj/D min ratio of the (8,8)C160 nanotube can reach to 1.15 when the field strength is only 0.8 V/Å. In contrast, the D maj/D min ratio of the (5,5)C100 nanotube is less than 1.05 under the same field strength. The results indicate that the nanotubes with large diameters are more sensitive to the electric field. For the nanotubes with diameter larger than 1.09 nm, the deformation induced by the transverse electric field could be remarkable under the field strength much less than 1.0 V/Å. Two reasons are considered to be responsible for it. One is that the nanotube with larger diameter is more flexible. The other is the wall of a nanotube with larger diameter receives larger external electric field potential difference in the transverse direction. The latter one can be judged from the change distribution. 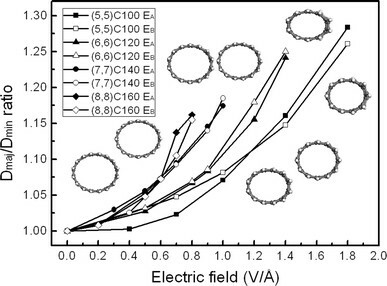 Figure 6 shows the Mulliken charge distributions of the center carbon rings of (5,5) and (8,8) nanotubes under 0.7 V/Å electric field. Although the maximum charge on the atoms in the (8,8) nanotube is almost the same as that in the (5,5) nanotube, more changes are induced on the wall of (8,8) nanotube due to larger external electric field potential difference. The phenomenon that armchair SWCNT deforms in radial direction under transverse electric field could be used to design small electromechanical energy conversion systems. However, further efforts are still required to understand the properties of deformed SWCNT under transverse electric field, such as mechanical modulus, vibration of radial breathing mode (RBM)  and quantum effect of locally deformed nanotube. In addition, since all the nanotubes regarded in this paper are armchair type, it leaves an open question that whether or how nanotubes with other chiralities will deform under transverse electric field. To understand the influence of chirality on such deformation, a further investigation should be required. The deformation of armchair SWCNT under transverse electric field was investigated by using the first-principle calculations based on DFT. The results show that the circular shape is deformed to the elliptic shape under electric field, in which the tube diameter along the field direction is increased whereas the diameter perpendicular to the field direction is reduced. The deformation of the nanotubes is mainly due to the change of dihedral angle. The electronic structures of the nanotubes are also changed under transverse electric field. The constituent parts of LUMO and HOMO belong to the separated part of atomic orbital in radial direction. The carbon atoms on the side of lower external electric field potential possess positive charges, whereas those on the side of higher external electric field potential possess negative charges. It is found that the ratio of the major diameter to the minor diameter of the SWCNT increases with increasing field strength and tube diameter. The field direction has little effect on the structural deformation. We thank Professor Guoping Jiang in Department of Information Science, Jiangsu Polytechnic University and Professor Cheng-Lung Chen in Department of Chemistry, National Sun Yat-sen University for useful suggestions. Mr. Kan appreciates the support from Innovation Fund for Postgraduates of Jiangsu University (CX08B_15x). This work was also supported by the National Natural Science Foundation of China (50775101) and New Century Excellent Talents (NCET-04-0515).